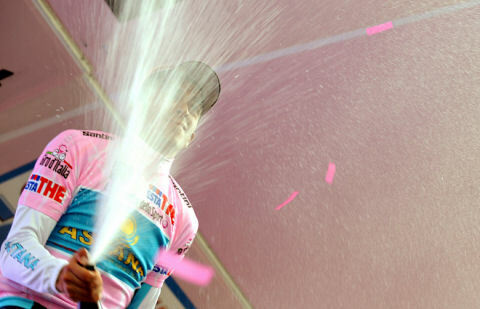 Alberto Contador returned home triumphant on Monday, June 2, the winner of the 91st edition of the Giro d'Italia. The people of Spain had no trouble organizing a triumphal march. 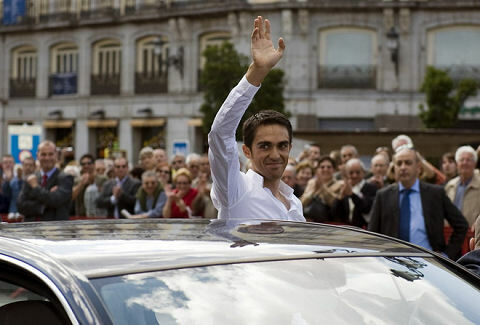 After all, only ten months ago Contador astonished the world by winning the Tour de France. There had hardly been time to strike the July celebration when he claimed the second epic victory in Milan. Alberto arrived with his fiancée Macarena Pescador at Barajas airport in Madrid at 3:00 p.m., where he was met by an excited throng. The couple gently pushed through the banners and flags, and were paraded with a consort of friends and family to a reception at Madrid's city hall. Reliving a scene so fresh in memory it seems like yesterday, Alberto met the president of the Community of Madrid, Esperanza Aguirre. Just as it had been last July 30th, Alberto was toasted by the leader of Spain's premier city. He addressed the crowd in the Puerta del Sol from the balcony. Once again, just as he had done in July, he gave Aguirre the gift of a lifetime--even for a political dignitary: a winner's jersey from one of the world's great contests. Only this time, the jersey was pink. From Madrid, Alberto and his entourage theaded their way through the crowded streets to Pinto. A convertible transported him safely through the crush of people. Pinto's city hall was amber with evening sunlight when he arrived. 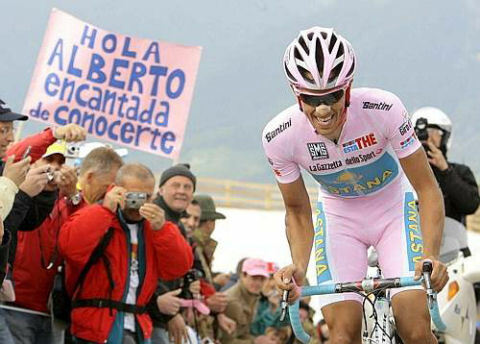 This time the banner, "Pinto con Contador, Gracias Campeón," favored the maglia rosa, not the maillot jaune. The 3,000 t-shirts handed out by the town council were pink, too, although they might have come from the same press, still hot, as their post-Tour prototypes. Again, a smiling woman mayor, Pinto's Miriam Rabaneda, paid tribute to the Giro champion on the balcony. Surrounded by friends and family, he thanked the crowd, displaying the elaborate scrolling trophy and the pink jersey. What color will it be next time? Around town, the celebration was manic: chants, yells, victory songs, blasts from airhorns. Half-dressed fanatics danced Baila el Chiki Chiki in the fountain. Citizens chanted, "We're not two, we're not four, we're the TOWN of Contador!!" The Stars and Stripes Forever was re-texted with one word: "Contador, Contador, Contador..."
This was Alberto's homecoming. It's astonishing to think that, at 25, it's nothing new to him. He says he's off to the beach again, to pick up where he and Macarena left off when he got the call for the Giro. Good questions are how many adoring fans will happen to choose the same beach, and will they bring airhorns? Contadormania: a public fervor kindled at Paris-Nice, a scorching blaze at the Tour de France, a wildfire at the Giro d'Italia. The hottest month is August in Madrid. Incidentally, that's the date of the Vuelta a España, the next grand tour and the home race of Alberto Contador. For Contadormaniacs, it will be the Pinto Inferno. Alberto, a lot's been made of your lack of preparation for this race, and even you were very skeptical about what you could achieve when you started the race. Now, though, with one day to go, surely even you think that you can win the Giro? "Yes, as you say, I can win the Giro tomorrow. I never thought it was possible. I never could have imagined it. "I was at home when the team called me. The team wanted me to come here and I wasn't at all convinced that it was the right thing to do. "A few people have helped me and my pride helped me push every day, but I still can't believe I'm here in the maglia rosa one day from the end of the the Giro, in contention to win the race outright." Has the difference between you and Riccò been your respective teams? "Yes, there's a big difference. My team didn't have great form, simply because it's not normal to be invited a week ahead of a grand tour. "If we'd had more time to prepare for this race, like under normal conditions, instead of having one domestique at the front today (Antonio Colom), we could have had three or four." What's been the hardest day or moment? "The hardest day was the stage before the Marmolada to Alpe di Pampeago. That day my sensations were very bad: I got cold on the descent [off the Passo Manghen] and felt bad on the final climb. "I began to believe in my chances the day after the Marmolada. I had the maglia rosa and I began to think that I could fight for the win. "But every day has been an important step forward. Yesterday, for example, was very hard for me; there were more kilometres than they said in the roadbook, which is incredible considering that these are the decisive stages. "But tomorrow is just another day. Let's see if I can win this race now." Who are you most worried about ahead of tomorrow? Riccò? "I don't have any reason to worry about tomorrow's stage. Anything can happen on the 21st stage if the last day is different. All I have to do is concentrate on having good legs. There's no reason to fear anyone." Tell us about some of the attacks you had to stave off today. "The other riders gave me a hard time on the Mortirolo, but it was very different than yesterday. That was a really tricky moment, I really had to use my head or I could have lost it all. "Di Luca was two minutes ahead, I had Riccò on my wheel and all of the others were waiting to attack me. I could have blown up. "Today I just had to stay with Riccò on the Mortirolo. I had good legs, plus I rode with my head." You won't be going to the Tour, but you could win the Giro and the Vuelta. That would make it a magic year. "I have to win the Giro first. When we heard that we weren't going to race the Tour, I was forced to switch plans. So, yes, it would be great to win the Giro and the Vuelta, but I'd still rather be able to win the Tour de France for a second time." How important was it to keep the maglia rosa today, and that Riccò didn't get any finish-line bonuses which would have given him the lead going into Sunday's time trial? "It was very important, without a doubt. It was a big blow for Di Luca and Riccò, and a big boost for me, that I kept the jersey even yesterday. "Today, with the three riders up the road, it was just luck. They went ahead for their own interest. They were going to try to win the stage. For us it just so happened to be a perfect situation." Last year we saw you winning the Tour in very aggressive fashion. In this Giro we've seen a much more defensive Contador. "The way I'm racing here is not my usual style. You mustn't forget that I came to the Giro without any preparation. "I didn't climb one mountain before I came here. I had to try to do the best I could with the form I had. I had to ride defensively and use my head. I'm just very happy to be where I am now." Alberto battled on the dangerous roads of the Presolana today, keeping a margin of only four seconds over Riccardo Riccò. Di Luca was a more imposing rival than Riccò. Aided by his super-domestique Paolo Savoldelli, he launched an attack that began a magnificent 36 km ride to the finish. His goal was not the stage win--an escape of overall noncontenders was several minutes away up the road. Di Luca's design was the maglia rosa, and he needed to steal 2.41 of Contador's time to wear it. Chasing Di Luca were several high-placed riders. Contador was aided by Astana teammates, most notably Andreas Klöden. Klöden did the job of a titan, pulling Alberto and the hangers-on across the slopes for miles in the rain. It was astounding domestique work. Klöden for Contador, Savoldelli for Di Luca, they smelted themselves into dull base metal to fuel their leaders' advance. Riccò had no teammate to help, and benefitted from Klöden's efforts. When he attacked, Alberto was hard pressed to follow. Alberto got his legs about him and limited the damage, but Riccò nearly got away with the prize. Contador kept cool and persevered. When Klöden dropped back and Riccò rode away, the maglia rosa goup cooperated. Surprisingly, it was Italians--Pellizotti, Sella, and Pozzovivo-- who pulled for Alberto. Riccò was incensed. 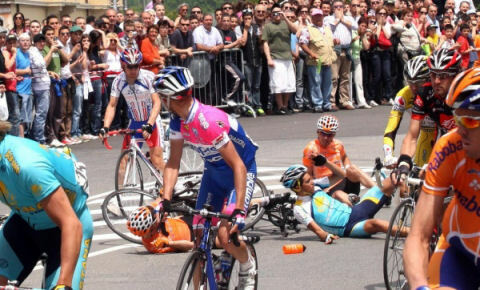 When he found out he had missed the pink jersey by four seconds, he spat the obscenity "Vanffancùlo!" and fired resentful remarks at Contador and the Italian collaborators. Alberto's reaction to Riccò's performance was to complement him on the attack and say plainly that he was not intimidated. Di Luca worked his way to within 21 seconds of the leadership. 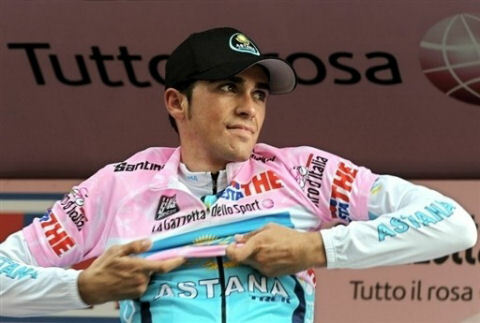 Alberto kept the maglia rosa, a bit unsteady on his feet at the podium. He had a big kiss for the Astana emblem on his jersey, and just managed to stay on his tired legs when he threw the flowers. “It was a very hard and long stage. The stage was longer than what it said on paper (245 km, not 228). The team deserves a ‘10’ for what they did today. "Compliments to Di Luca and Riccò today after making beautiful attacks, which makes for an interesting Giro. I kept the maglia rosa, but I’m not going to obsess on the differences to Riccò or Di Luca. It was important to keep the pink jersey today for the psychological factor. They still have to take it away from me. “I just couldn’t go any faster. I’m not as well prepared for this Giro so I had to do the best I could under the circumstances. RESULTS : Contador finished Stage 19 in 12th position, 6.21 behind Vasil Kiryienka of Tinkoff. He still leads the Giro d'Italia overall by a margin of .04 over Riccardo Riccò. Today's stage began with two laps of the course outlined for the World Championships in 2009, and ended with another two on this year's Worlds' route in Varese. Astana controlled the peloton. An escape group made up of Giro celebrities (Bettini, Visconti, others) got away early. Astana allowed it, since it contained no threats to Alberto's lead. Alberto stayed safe in the pack, although he dug in and sprinted in the last few kilometers. The stage win had already been secured by Jens Voigt several minutes earlier-- Voigt's first ever in the Giro--and there was no need for Alberto to sprint to preserve his lead. He might have been testing his legs. A sprint finish for bonus points tomorrow is a possibility. Alberto is turning pinker as the week goes on. 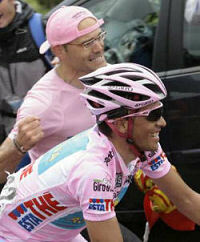 Today he showed the Cipollini influence: helmet, glasses, leader jersey, shorts, bike accoutrements, pink, pink, pink. The motocams love to dwell on the maglia rosa, so fans were satisfied with some good views of the leader. He looks serious, focused. No mugging for the camera. As the race goes on, he seems to be recovering some fluidity of motion. That fluidity, his elasticity, is one of his weapons, a crucial element in his attack style. It's a joy and relief to see it. Alberto has performed brilliantly in the last two months, but it's been weeks since we've seen him race healthy. Contador shows maturity and focus in his post-stage comments. Other character traits are visible: He's considerate, and shows appreciation for the people around him. Also, the guy who likes to create spectacle on the bike is showing a talent for doing it verbally. His words today made tomorrow's foray into the Alps irresistible. “Tomorrow is a difficult stage. All the GC riders will be attacking me, but I hope to have the legs to be able to respond. I know the fans would love to see me attack, but I only have to respond to the others. Since Alberto's closest rival is Saunier Duval's ace climber Riccardo Riccò, there is a question of Riccò grabbing a time bonus that could give him a boost after tomorrow's grueling mountain stage. “I want to say thanks to the Italian tifosi. They have cheered for me as if I were Italian. They are calling my name from the road and cheering me on. It’s a big surprise that they are behind me in this manner. Results : On Stage 18, Alberto was 14th at 7.51 off the time of CSC's Jens Voigt. He leads the general classification. His nearest opponents are Ricco at .41, Simoni at 1.21, Bruseghin at 2.00, Pellizotti at 2.18, and Di Luca at 2.47. A sunny tour of the lakes really made Alberto's pink jersey pop as he and Astana glided through an easy stage. Cavendish of High Road let his lead-out man André Greipel take the win. The two posted up together across the line. Alberto's adding pink elements as he goes: today pink handlebar tape joined the pink jersey, helmet, glasses, levers, etc. We'll try to catalogue it all, by and by. Colorful, yes, but he's going with Armstrong's choice of team kit shorts, not the Cipollini look from head to toe. And because Armstrong rode that way so many times, through the Slough of Despond and the Valley of the Shadow of Death, not to mention the Fields of Elyssium, the garb's got a warrior/hero association. No fashion rebel here. Good choice! Note: Armstrong never did it in pink. Alberto on the Giro podium looks calm and happy. His smile isn't the thoroughly dazzling, deeply happy expression caught by the cameras early in the Tour last year. It's congenial and modest, a more piano mood. Perhaps the spectacle will come later this week. Can you attack with a smile? Alberto said after the stage, "Today, was a good day. I felt good from the first moments of the stage." "The escape went early... So it was almost like two days of recovery. My allergies have not given me any problems, so that’s a good sign for the next days." 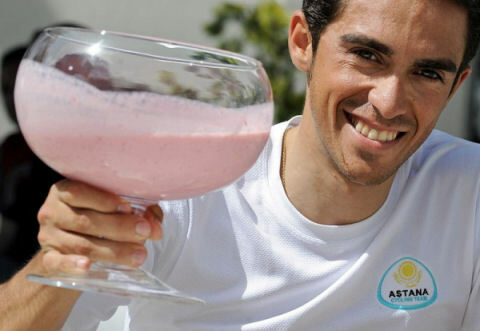 As planned, Contador used yesterday's rest day wisely. He got a first hand experience of the road for the excruciating Stage 20 journey across two giants of the Alps, the Gavia and the Mortirolo. In a car with Toni Colom and DS Allain Gallopin, he did reconaissance of the climbs. 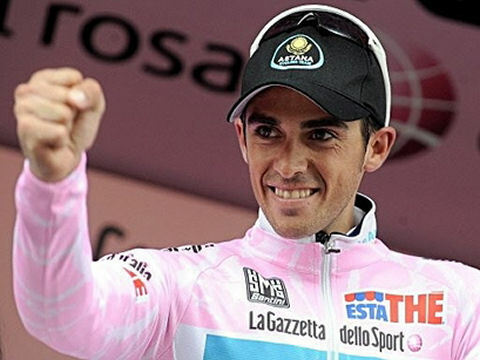 RESULTS : On Stage 17 Alberto Contador, the leader of the Giro d'Italia, was 4" behind the Greipel/Cavendish duo. 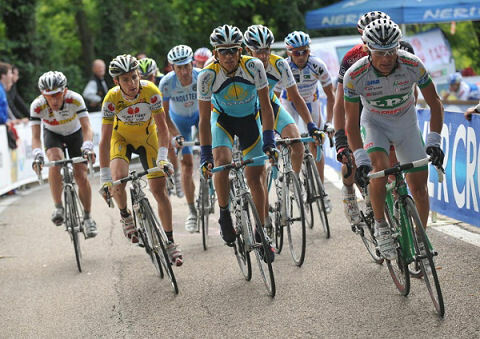 Alberto Contador leaves the Dolomites in an enviable position. Here’s the account the maglia rosa makes of the high mountain trek that has given him Giro leadership: “The very best account, generally. The first day didn’t go as well as I would have liked. I wasn’t great. I don’t know if it was allergies or because it was the first day in the high mountains, but I lost some time that I shouldn’t have." The big picture changed Sunday, when Contador started feeling like himself again and recovered his confidence. “In the Marmolada I already felt far better and I got my confidence back in the time trial, where I was able to keep my rivals at bay and even gain time on some of them. If they had told me before climbing the mountain that I would finish Stage 16 with a 41 second advantage, I would've said amen to that." What’s it like being in the Giro, how would you describe it? I’d say that it seems like a funny race because I came here on the rebound and I’ve been taking it one day at a time. There’ve even been stages when I thought I was going to retire, but then I started feeling better every day and haven’t noticed a feeling of pressure. I’m sleeping really well and I haven’t been nervous, not even about the time trial. That’s why it seems weird, because even in a one week race I feel nervous about time trials, but not here. I think that’s why it’s going so well, because I don’t notice the pressure. That’s the secret of success. After the time trial, what are your plans? First, rest. I’m going to take advantage of the day off and look at what's coming in the last five days. There are two stages that aren’t too problematic, where we’ll need to control the bonuses, and then the other two mountain stages. 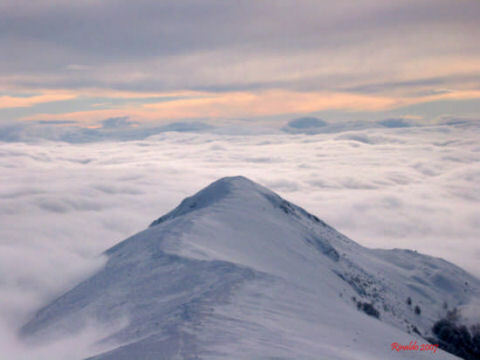 In the summit finishes I more or less hope that that differences will be small, like they have been so far, and the day of the Mortirolo—-clearly, it will be very hard. The race will be on, from the very beginning. Then comes the last time trial. As to my rivals, I’ve got some advantage, and even if I arrive with a bit of a deficit, I’ll be able to make up for it. Who are your most dangerous rivals now, and in what order? 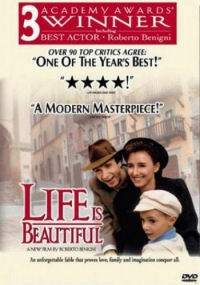 Riccò and Simoni. To face them, I’m also counting on the help of the team. The team is very well, very motivated and all the riders are ready to work to win. Having teammates like Klöden and Leipheimer is insurance and really boosts my confidence. I have total faith in them and proof of this is that in the time trial, instead of competing, they let it go. That’s a signal that they’re all for the team. How does it feel to have the maglia rosa on your shoulders? I’m living the experience with great joy. People are treating me with enormous affection and it’s been a nice surprise to see that the Italians like me. Alberto did what he needed to do in the uphill ITT today, gaining time on his rivals, and solidifying his place in the maglia rosa. The climb to Plan de Corones was a beast. The course was acutely slanted, unrelenting, so that many of the riders seemed to stop going forward despite titanic pumping of the pedals. The ascent was so severe that Kiryienka of Tinkoff decided to chuck pedalling altogether; he got off the bike and walked. Alberto rode strong and steady, his form showing progress by leaps and bounds. He had a bit less lovely suplesse than usual, having to go easy on his fractured left arm. This quieted his movement when out of the saddle, and added a tiny bit of stiffness to his dancing style. The road, part of it gravel, ranged from 9% to 16% gradient for most of the 12.9 km test. In the saddle, Contador was able to economize movement and keep an aerodynamic position in spite of the massive physical effort required to tackle the slopes. He handled it with more fluidity and grace than anyone else shown on camera. It was cruel, however, and everyone who crossed the finish line looked like figures from The Triplets of Belleville. It wasn't pretty. Franco Pellizotti won the day, Sella did his best to win his third in a row, and Gilberto Simoni showed that old legs can be good legs. Riccardo Riccò, in a blocky chugging style, tried defiantly to run off. Contador managed to give it just enough to grab a few seconds. He was 4th on the stage, and leads the GC, 41" ahead of Riccò. "This morning I went to check out the climb very early. Honestly, I liked what I saw. This was something for a real climber like me. "After my performance of yesterday, I was more confident before the start of the race than I had been at the start of Sunday's stage. Plus today I didn't have any technical problem like I did yesterday when I had to do the Marmolada climb with a defective wheel. "I'm surprised as well. I'm happy that I've reached this level with the poor preparation I had. Fortunately, the weather is not too good here. That helps me. "The Giro is not over yet. I am glad that riders like Di Luca, Bruseghin and Menchov lost time, but I have to stay awake for Simoni and Riccò. In theory the final time trial suits me better than them, but some other stages still can put me in difficulties. "Especially the stage with the Mortirolo can be dangerous. Fortunately, I have a strong team. I strongly believe that they'll will work for the same goal: bringing that pink jersey to Milano." RESULTS : Alberto was 6th today, 2.27 behind Emaneule Sella. He took over FIRST PLACE in the GC. Alberto raced for the first time in the Dolomites today. It was the first of three beastly stages stretching from now until Monday's Stage 16 time trial at the Plan de Corones. One look at his face during taxing last 50 km revealed that he was not on a good day. The normal expression of grinta that goes with climbing was not there. Instead there was a knitted brow, bags under the eyes, and off color that goes with a person who isn't feeling well (and is climbing a mountain on a bicycle). None of the favorites put on a great show. Emanuele Sella of CSF Group Navigare, who started the stage 24.22 off the lead, was the lone star of the day. He finished a solo ride eight minutes before any of the overall contenders. The effort got him a Giro stage win, but had little effect on the main players in the GC. Visconti rode bravely, but lost his maglia rosa to second-placed Bosisio, who just managed to keep it away from Alberto. Alberto rode through misery caused by allergies, an injury, and another dental problem not as serious as the abscess at Basque Country. He arrived just five seconds later than Bosisio. Five seconds from the maglia rosa on a bad day! We should all have such bad days. “It’s been a hard stage from the very beginning, with two climbs that were uncategorized but were done very fast. "Allergies really affected me at the outset, although in the penultimate climb I already felt better, even though on the ascent I couldn’t get my raincoat on. “On the last ascent (Alpe de Pampeago) I noticed that my state of form isn’t the best, which is normal when you’re not adequately prepared. For me it was really hard, because there were rivals who were stronger, although the good thing is that in spite of all this I’ve hardly lost any time. “It was a very, very tough climb; I tried to find my good legs, but I couldn’t do it. Now I’m only five seconds from the leader and will have to go on like this, as expected. RESULTS : 15th place for Alberto today, 9.33 behind Emanuele Sella. In the GC, he's now 2nd, only 5 seconds from new leader Gabriele Bosisio. No photo finish needed today. The winner was Cavendish, for sure. The Astana boys looked well and happy in the peloton. The moto-cam showed us Alberto's big smile; no signs of pain, fatigue, or stress. Klöden looked affable, Colom stuck his tongue out at the camera. It was time to enjoy the end of the easy part of the Giro, the part that's blissfully free of Alps, and there's nothing to worry about, apart from bloody crashes every day. For the second day in a row the race jury permitted the final time to be taken at three kilometers from the goal. As the pack beat a path to the finish, a split formed--no harm, no foul, since it gave peloton a chance to stay out of the sprint Mix Master without losing time. However, something went wrong, somewhere. There's no clear explanation so far, but riders who didn't make the front split lost 13 seconds. The lost time was first figured at 1' 13", but after review one minute was restored. Contador was in the back section, at 53rd, accompanied by teammates Toni Colom (54th) and Levi Leipheimer (55th). All lost 13 seconds. Also missing the split were many favorites: Visconti, Di Luca, Savoldelli, Riccò, Bruseghin, Bettini. The good news is that Astana's Andrea Klöden was given the winner's time, and moved to 4th in the GC. Why this happened when the books say he crossed the line in 106th place is a mystery. The stage results as listed are currently a mess. Tomorrow morning an explanation is in order. Tomorrow Astana leads the charge into the Dolomites. Stage profiles for the next three days are astonishingly brutal-looking. Everyone will be watching Alberto, Klöden, and Leipheimer to see if they deliver the quality of entertainment Giro organizers demanded when they opened the door to Astana just three weeks ago. RESULTS : Alberto came in at 53rd, losing 13". In the GC, he is still 3rd, at 6.59. Astana is currently tops in the Trofeo fast team category; for the Trofeo super team, they're 3rd. A bunch sprint was meant to be, from the very beginning. On a flat featurless stage, there was time to nurse fractures and bruises, look at the poppies, maybe play a little Sudoku. There was rain again. The weather made the countryside prettier, especially the sinuous geometry of the Ferrari F1 test track at Modena. Can asphalt be attractive? Yes, it can, when it's wet and grey and swirling, surrounded by green. Curvy wet city streets are not so attractive to cyclists. Faced with a bunch sprint through cramped quarters, the race jury intervened, and took finish times for the stage 3 km from the goal. The peloton was then free to lay back without losing time, while the madmen raced for the line. The peloton split, the sprinters flew, while the overall contenders got out of the way. Daniele Bennati and Mark Cavendish pushed to a photo finish, Bennati succeeding by only a couple of inches. RESULTS : Alberto came in 78th, s.t. Bennati. On the GC, he's still 3rd, 6.59 from Visconti. Hills all day, rain, and burnt-out legs from yesterday's time trial led to more mishaps on the road to Cesena, Marco Pantani's hometown. 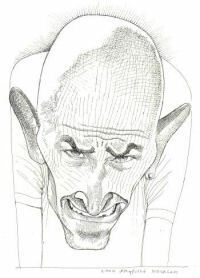 Alberto, whose friends used to call him Pantani, stayed safe. An early escape made up of guys without competitive times stayed away, crossing the finish line more than three minutes ahead of the next group. The big GC men chased, but never looked hellbent to capture the escapers. The chase group waxed and waned around a stable nucleus of DiLuca, Contador, Klöden. Simoni, Ricco, and Van den Broek. When the group experienced nervous spasms, agitating or trying attacks, both Contador and teammate Klöden had no problem staying with them. Good entertainment: Ricco and DiLuca are clearly nervous around Contador. A number of important riders were involved in crashes that shaped the GC more than the tough ascents. Among them, Leipheimer, Piepoli, Bosisio all ran into rotten luck. 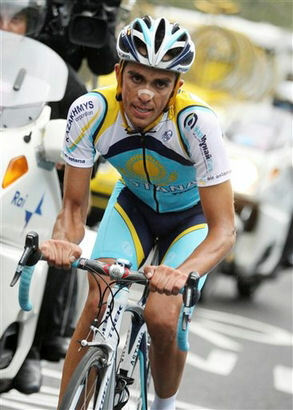 Mauricio Soler--star climber and a worthy rival of Contador--abandoned, unable to manage with a painful broken wrist. Worst was maglia rosa Visconti. The current Giro leader managed to finish the stage only with the help of his mentor, multi-champion Paolo Bettini. Bettini sacrificed his own hopes to shepherd his young disciple to the end. When the GC pieces were all picked up and reassembled, Alberto with his fractured arm found himself in third place in the overall. Ahead of him were Visconti, who was in great pain when he pulled on the new pink jersey, and Bosisio, also shaken up and not considered a contender. Today's difficult time trial was run in variable terrain and rainy weather. The route, mostly flat in the beginning, started to slope up at about 18km. From that point on, the climbing never stopped until the stage ended in the hilltop town of Urbino. How it would suit Alberto Contador was a question on many people's minds. Normally a climbing TT is Contador's forte. Riding today with a fractured left arm, there was a good chance he would be unable to find a reasonably pain-free position on the specialty bike. Some loss of power due to the injury and necessary caution on dodgy wet roads were to be expected. All in all it looked like a day to survive and hope for better conditions tomorrow. After a shaky start out of the gate, and Alberto was off camera for miles. Live action on the road was delivered to viewers in ripping good fashion by commentators Anthony McCrossan and Brian Smith at cycling.tv . Three intermediate checkpoints were monitored diligently by Smith, who spewed a rapid fire of figures and analyses. It really is a smart game, time trialing, and monitoring the splits can be great entertainment. With Smith's android-like quickness at breaking down the math into layman's terms, it was an exciting broadcast. By the time Alberto hit the road, most of the favorites were already out on the roughly hour-long course. It was impossible not to think back to Alberto's vulnerability last year in Stage 19 of the Tour de France. And to his strength at Castilla y Leon, and dominance in Basque Country. Just these three races in the last eight months have shown a meteoric rise in skill against the clock. Would today's stage be another giant step forward for him as a time trialist? The answer was yes. When Contador came through the last time check at 32.2 km, it was clear that he was the only rider with a chance of dislodging leader Marzio Bruseghin. The final seven kilometers were the most difficult, a tricky ascent--hard with a fracture-- and on wet city streets. This section had already taken time out of teammates Leipheimer and Kloden. Alberto couldn't maintain speed here, either. That didn't stop him blowing apart times set by the other favorites. He came within 10 seconds of Bruseghin, the former Italian time trial champion, arriving in a stunning 2nd place on the day. “I tried to win the stage. That was my first objective,” commented Alberto Contador, who arrived in 2nd position at 8”. “Believe me, without the rain, I would have been the winner. I didn’t dare to take risks in the end. The last 500 meters on the cobblestones were very slippery as well. Anyway, afterwards I am happy with the time I gained today. My elbow? In the beginning it bothered me a bit, but the further we went in the stage, the better I felt. My second part of the time trial was indeed much better: the elbow, the legs, and the performance. RESULTS : Alberto was 2nd today, just 8 seconds from winner Marzio Bruseghin. He has moved to 4th on the GC, 6.59 behind Visconti, and ahead of all others considered contenders for the final maglia rosa. RESULTS : Alberto came in 105th today, 4 seconds off the stage winner, Liquigas's Daniele Bennati. His GC rank is unchanged, still 8th place, 7'56" behind leader Visconti. The course today didn't present major difficulties like yesterday's into Pesocostanzo. But it was challenging enough. From cuff to toe, Italy's boot-shaped peninsula is mountainous, except along the coast and in a few other areas. Non-Italians, especially tourists, know about the Alps and Dolomites, whose grandeur is legendary. 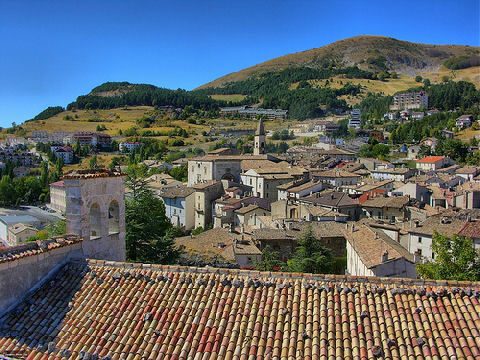 A bit less statuesque are the Appenines, Italy's spine. But they're only a bit less imposing! Problems getting from here to there have shaped history and society in Italy. What was a blessing for Caesar was a curse to Hannibal: It's bad enough to think of crossing Italy on an elephant. Imagine doing it on a bike! The peloton has negotiated this jagged landscape for two days now in their journey westward through the parcours. For Astana and their lack of preparation, it's hard to imagine how exhausted they must be. Their first chance to rest is still two days away. Alberto took a spill about 87 kilometers into the race today. Astana's Steve Morabito also hit the pavement. Both were able to continue, Alberto with bruised tendons and muscles in his right elbow. Morabito fell again, further aggravating a shoulder injury sustained earlier in the Giro. He abandoned the stage. Alberto tenaciously rode back into the maglia rosa group. He finished with a large pack, all receiving the winner's time. No harm done to the GC. In fact, he moved up one notch to 8th place. Now pain is a factor, hopefully not one that will impede his progress to form. 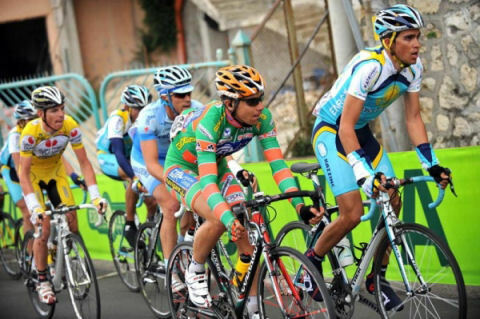 Astana's only choice was to bring three leaders to the Giro. This leaves them understaffed with gregarios. Coupled to the loss of Benjamin Noval--unable to come to Italy because of an illness-- is the unfortunate loss of Morabito. RESULTS : In spite of his crash, Alberto finished 23rd, s.t. Riccardo Riccò. He's now 8th in the general classification, 7.56 behind Quick Step's Giovanni Visconti. RESULTS : Alberto was 8th, 2'10" behind LPR's Gabriele Bosisio. In the GC, he ranks 9th, 7'56 behind maglia rosa Giovanni Visconti of Quick Step. Today's stage was the longest of Giro 2008. If it hadn't been for a protest led by the maglia rosa, Franco Pellizotti, it would have been longer. The riders, exhausted by long transfers and annoyed by a four-hour wait for the ferry from Sicily, went to Giro boss Angelo Zomegnan with complaints. Zomegnan proved again that he exercises the right to change his mind. (His about-face was what brought Astana to the Giro with only a week's notice.) To address the riders' grievances, he agreed to shorten the race by omitting a 33 km circuit near the finish. There's an interesting story about the protest at VELONEWS. It was still a long haul for a peloton with four days to go before the first rest day. An escape group went up the road and around the bend, getting as much as 14+ minutes ahead of the pack. The GC contenders allowed it to stick. The big names came in more or less together, all more than 11 minutes behind. Alberto hustled to the finish in front of the others, maybe testing himself, maybe with a point to prove. It was a fleeting moment, but it was cool. RESULTS : Alberto arrived 11.34 behind stage winner Matteo Priamo. He lost 9:38 on the GC, and is in 19th place overall. 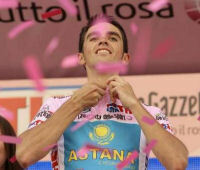 Alberto has said he’ll go day by day in the Giro, using the first stages to gain form, then decide whether to continue. Today was another day, hillier than yesterday, but piano. Crashes and mishaps were few, the most noteworthy being a broken chain in David Millar’s bike that caused him to miss the sprint and throw his bike over the rail in disgust. A long breakaway stayed away, but only just. The first four riders to finish had been ahead all day. No. 5 across the finish line was Bettini, arriving 30 seconds later with a large portion of the peloton. Alberto was near the front of this group, with most of the favorites. 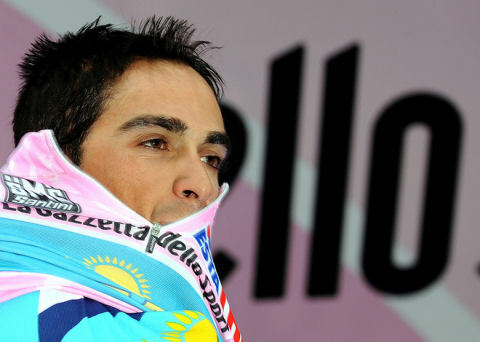 What the future will bring for Alberto in this Giro is a good question. 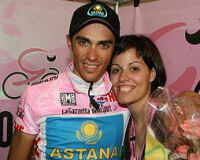 Chema Bermejo noted yesterday at as.com that a rider of his level once won the Tour with even less preparation. When Johan Bruyneel called Alberto Contador to tell him that he had to go to the Giro d’Italia, eight days before the race began, the Madrileño said to him that no, he wasn’t in form and didn’t want to make a fool of himself. Three hours later, the Astana manager called him back. Alberto had already ruminated over the situation. The Giro organizers invited the team as long as they brought their three stars: Klöden, Leipheimer, and irreplaceably, Contador, the winner of the last Tour de France. Contador traveled to Italy with the team to do some stages and then retire. But the situation is changing. “It’s going better than I had hoped,” the Madrileño said yesterday. He has started considering the possibility of getting to the mountains in good form, during the last full week of the race. In the two road stages (stages 2 and 3) ridden so far, the pace of the peloton hasn’t been demanding and that has been encouraging and helped him gain form. After winning the Giro d’Italia in 1998, Marco Pantani enjoyed the celebration, took two weeks vacation, the death of a friend also kept him from training, and went to the Tour de France practically without training. In the prologue time trial in Dublin, Il Pirata came in ninth from last place. At the foot of the Pyrenees he was eight minutes behind the leader (Frenchman Laurent Desbiens) and over five minutes behind German Jan Ullrich. Nobody paid any attention to him. And he won the Tour. RESULTS : Today Alberto was 10th, 31 seconds behind winner Pavel Brutt of Tinkoff. The general classification remains the same: he's 16th, at 30 seconds. This was a quiet day, until the last twenty minutes, when nerves started to bubble on a short but steep climb. DiLuca, Riccò, Bettini—eligible riders—dug in, the pack strung out, and those less able or less motivated shelled out the back. On the descent, Paolo Savoldelli set a furious tempo. The pack shifted into SPRINT mode. Bodies churned like old-fashioned eggbeaters, making violently scrambled eggs. CRASH! A rider lost control, and brought dozens down on top of him. Bikes flew into the air. Bones were broken. At least one rider landed on his head. A few riders in front of the crash survived to sprint. The victory went to the brash young rider from the Isle of Man, Mark Cavendish of High Road. Cavendish, almost 22, is a brilliant entertainer. Is it fair to say he’s the heir to Robbie McEwen? He might put on good shows like this for the next fifteen years, if he survives the Giro. It’s easy to pick Alberto out of the peloton. He’s like a person in church who sits in the same pew every week: you can reliably find him in the front 30-50 riders, closer to the front near the end, usually to one side. Today he rode hard for Astana, testing himself bit by bit and making an effort to build form. Maybe it’s just not in his character to take it easy in a race. It wasn’t Alberto’s choice to come to Italy. His next goal is the Dauphiné Libéré; he’s not obligated to kill himself trying in the Giro. He seems to be watching, however, assessing the race. He’s hatching a plan. What is it? RESULTS : Alberto finished Stage 4 in 84th place, same time as Cavendish. He is now 17th in the GC, 30 seconds behind maglia rosa Pellizotti. The Giro is a slaughterhouse. There is carnage every day. Riders crash hard and often. They skid on the asphalt, landing in piles of dozens, twisting limbs, mangling bikes. Yet, the fundamental reason for the pile-ups isn't weather or road conditions. Nor is it wayward bidons or the perversity of the laws of physics in general. The thing that makes the Giro so dangerous is what also makes it so beautiful: the passion. The feeling is often maniacal. It showed today as the live action moto-cam lurched around 90-degree turns focusing on the faces of the crowd as closely as possible. Insane! The feeling is sweet, too. Giro camera work is obsessed with females. Young buxom ones, of course, but also babies. Old ladies with creased faces are spotlighted as if they were painters' models. These passionate sprint stages are tricky places for a climber and GC contender. Alberto is riding smart, keeping within the leading 25 or 30 riders, today usually on the left of the peloton. There's less danger of being caught in a crash there, plus he can keep his eyes on the favorites. He said to MARCA that he's taking it day by day, waiting for the Pescocostanzo stage on Friday. "According to how I feel there, I'll decide what course to take." Alberto finished 60th today, same time as stage winner Daniele Bennati. He's now 16th in the GC, 30 seconds off the lead. 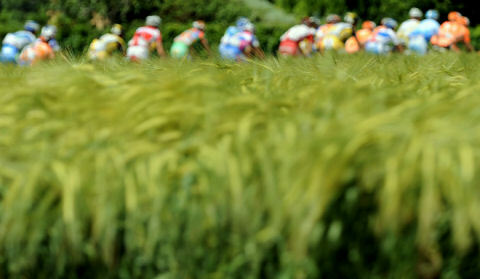 There's something rather wonderful about the Giro d'Italia. It's different from the other two Grand Tours. Everything seems faster, more edgy. The backdrop to this race is a visual feast, ancient culture fills every camera shot. This afternoon, the Hellenic temples of Agrigento were breathtaking. Italian cyclists are always hungry for a win at the Giro. They are tenacious, and just a bit crazy. The run-in today was typically fast and chaotic. Although Caisse d'Epargne's Joaquin Rodriguez made a break at 1km to go, he was reeled in close to the line by five Italians, Riccò, Di Luca, Rebellin, Pellizotti and Savoldelli. Pellizotti wears pink tonight, and is Eurosport's outside tip for the podium in Milan. Contador and Colom were visible in the main peloton until the last little hike up to the finish. Leipheimer was there too, sadly invisible in his national colours. RESULTS : Alberto finished 18th at 10", and now lies 19th overall at 30". Klöden was 10th, Leipheimer 31st and Colom 37th. A good day for Astana. Astana completed the TTT course in 27:01 today, finishing 7th, 31 seconds behind winner Slipstream. Not a bad showing. Astana stayed together, unlike the American rivals who beat them. The Slipstream team had prepared carefully, training for weeks near Girona in Spain. To the Astana boys, it must have been an enviable position. Alberto was seen having to hustle at the back of the line at one point. He might have been wishing he'd known sooner where fate would land him on May 10th. However, three Slipstream riders were not on a good day, and were dropped. Surprisingly, part-owner and British TT champion David Millar was one of them. Christian Vande Velde was the first to cross the line. With a puckish (irresistible) look on his face, he slipped on the winner's jersey, and became the first American in 20 years to wear the maglia rosa. To find another American in pink, you have to go back to Andy Hampsten in 1988. Hampsten went on to win the overall title that year. Astana didn't dominate, for a change. Hmm...wonder why? The team time trial was a good introduction to the race for a squad tossed together at the last moment. Today was a chance to focus and cooperate, away from distractions in the peloton. 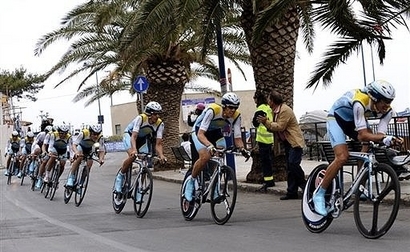 Did Astana send a functional team to the Giro, or three divas and six supernumeraries? The team Astana put together for the Giro was selected for unusual reasons, to satisfy the demands of a prima donna race organizer. This thought-provoking precedent has yielded a roster like Mulligan stew. The guys are practically strangers: how can they ride a TTT like seasoned comrades-at-arms? Plus there are too many chiefs and not enought Indians. With Contador, Klöden, and Leipheimer, Astana is heavy on the big guns. We understand why, but it raises questions. How will three leaders handle a balance of power? At the psychological level, who considers himself the true leader? Who has the people skills to take special care of his helpers, to thank them, to make regular deposits into the emotional bank account? All of them? Will the domestiques work for one leader as willingly as another? Yes, they're all very professional, but still, you wonder. One crucial element is missing in the Giro team, the man that could have anchored the old/new, east-meets-west roster. The strength, the power, the crux. Benjamin Noval. Astana needs him. What do you think? If you'd like to discuss, come over to our BLOG.